Last year (Sept 2011) I responded to a series of questions on LinkedIn with a piece that looked at a number of CMS metrics that are commonly used. These include the Real Story Group CMS subway map, some CMS Matrix numbers, the security vulnerabilities at NVD, and some notes from Google Analytics. With the World Plone Conference getting set to kick off in Arnhem, it seems like a good idea to run these numbers again and see where we stand. Where is Plone used, functionally? The Real Story CMS subway map shows some interesting changes with categories up to 8 from 7 last year. Plone still lies at the intersection of three lines, the only open-source CMS to cover Web Content & Experience Management, Portals & Content Integration, and Collaboration & Social Software. You need one of the heavy hitting commercial vendors like IBM, Microsft, Oracle, or OpenText (formerly Vignette) to get the same combination of capabilities. Geographically? 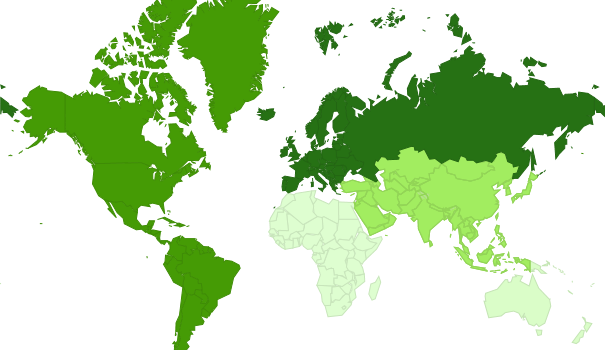 Once again, as a proxy I'm using the locations of Plone.org site visitors as visualized with Google Analytics. 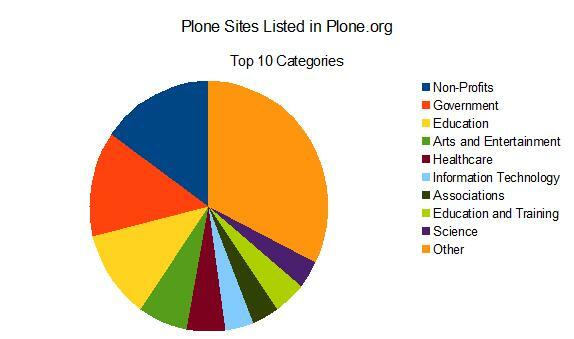 Plone is used world-wide, although it's most commonly found in Europe (45%) and North America (24%). Both have lost a couple percentage points because Asia now comes in with 16% (+3) and South and Central America with 10% (+2). Oceania with 3% and Africa with 2% remain steady. As always, Plone has one of the strongest i18N capabilities of any major CMS. What kind of companies are using it? From Plone.org we can track down a large sample of self-reported sites that use Plone that are conveniently categorized by type of company (61 of them, no less). Non-profits (15%), government (14%), and education (11%) top the list, taking 40% of the pie. Down from 44% last year are the 32% grouped into "Other," each of the 51 remaining with less than a 3% share of the pie. You can visit Sites that use Plone for the full list and lots of beautiful exemplars. Growth potential? (Is Plone competing with Drupal and Joomla?) Plone is always being compared with Drupal and Joomla because it's an open-source CMS. But Plone has never focused on the free or low-cost mass market. Instead Plone has built up an ecosystem of professional consultants and businesses that provide the enduring value. With it's fine-grain security model, powerful workflow engine, high usability, and large feature set, Plone remains one of the top CMS today. 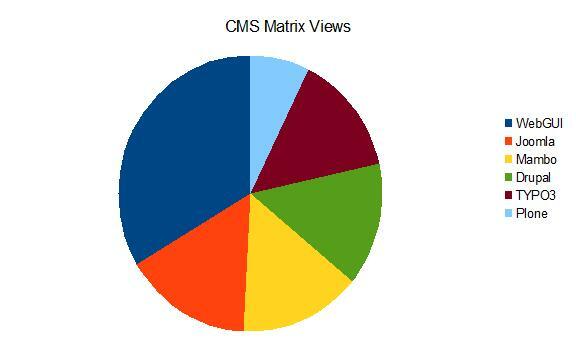 CMS Matrix shows Plone to be one of the top six most frequently viewed CMSs in their exhaustive listing of over 1000 systems. How secure is Plone? Plone continues to be the most secure of all the major CMS. 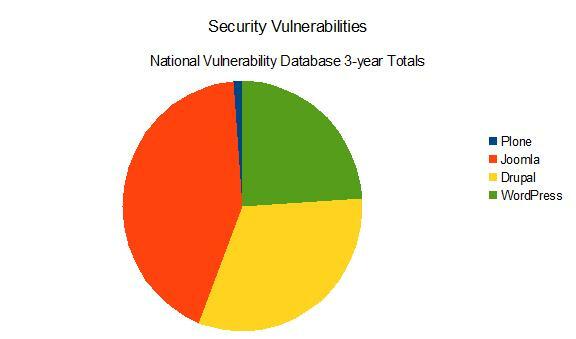 The National Vulnerability Database shows Plone with only 10 issues in the past 3 years. Drupal had 232 in the same time interval, Joomla had 404, and WordPress had 127 (a 36% increase over last year's 3 year running total). Yes, that tiny blue sliver is Plone's share of this group of CMS's security vulnerabilities. As the Sirius Cybernetic Corporation says, "Share and enjoy!"